Breast thermography can detect the subtle physiologic changes that accompany breast pathology, whether it is cancer, benign breast tumors, mastitis, fibrocystic disease, infection or vascular disease. It is an effective means of looking at breast cancer risk assessment or monitoring breast cancer treatment. This comfortable procedure involves no radiation or compression and it is safe for women who are pregnant, nursing or have breast implants. The benefit of breast thermography is that it offers the opportunity of earlier detection of breast disease than has been possible through breast self examination, doctor examination or mammography alone. Why is it the perfect method for prevention? Because today we know that breast cancer remains microscopic and clinically undetectable for 75% of its lifespan, approximately 8 years. Thermography has the ability to detect early changes in blood supply and physiologic changes in the breast before a mass is large enough to be felt or seen on a mammogram. Combined with an unprecedented role in risk assessment, screening for younger women and radiation free, breast thermography offers women information that no other procedure can provide. In a breast thermogram, five images are taken, including a frontal view, two lateral views and two oblique views. The underarm area is also captured in a breast thermogram. In addition to breast thermography, we offer full body or region of interest scans. These clinical imaging scans can detect and monitor a number of diseases and physical injuries. They are able to view inflammation and visualize pain. This is particularly useful for someone who cannot find the origin of their pain. The information is very helpful for further diagnostics and for the treating healthcare provider. It is used as an aid for diagnosis and prognosis, as well as monitoring therapy progress for many conditions and injuries. Early information about inflammation in the head and neck can lead to appropriate preventative treatments. Thermal findings related to various organs can allow for early warning signs and treatment for areas of concern before they become more serious problems. Allergies, sports injuries, TMJ, carotid artery disease, cardiovascular disorders, thyroid dysfunction, irritable bowel disorders, and dental pathologies can be visualized. With a full body scan, four views of each body area are taken beginning with the head and neck, thyroid area, chest and breast, abdomen, back, and upper and lower extremities. This screening can help determine a diagnosis for unexplained pain in a specific area of the body. Region of Interest scans are an accurate way to focus on one area of the body that is causing concern. Usually there are four views of any body part being scanned; anterior, posterior, and left and right lateral. The views give the interpreting physician adequate pictures to make an accurate interpretation. Many times individuals have had a trauma to an extremity and the usual six weeks has transpired, and they are still symptomatic. A region of interest view targets the specific area to be scanned and gives physiological information to assist in healing techniques or recommendations for further therapy needed. Below, under â€œShort Case Historiesâ€�?are examples of Region of Interest thermograms. This test is offered when the patient has more than one area of interest to be screened. This can include a breast screening for one of the regions. For optimum proactive and preventative health screening, a full body scan includes the head, neck, upper body, breast, abdominal region, legs, knees, feet, hands, and arms. Call today to schedule your appointment, 614-636-3362 or visit the FAQ link on our Home page for more information about our services and answers to frequently asked questions. Complex Regional Pain Syndrome right foot, significant increase in sympathetic motor tone right foot 3.7Â°c colder than left foot. A cold stress test was positive, (no sympathetic change). Thermography confirmed right L2/L3 root irritation and myelography and CT scan showed a large, right L2/L3 prolapse with L4/L5 root involvement. Post-Traumatic Complex Regional Pain Syndrome. A 34 year old female supermarket worker injured her left wrist 3 years previously. There were typical features of CRPS including severe persistent pain and color and temperature changes in the left wrist and hand. There was a good initial response to a right cervical sympathectomy, but a year later symptoms returned. Treatment with I.V. Guanethidine gave some relief and reduced the temperature differentials significantly from a delta T of 6.2Â°c pre treatment to 0.8Â°c post treatment. A 28 year old male carpet layer presented with a clinical left carpal tunnel syndrome, The EMG was normal but the left median sensory nerve latency and amplitude suggested minimal dysfunction relative to the right side. Thermography during sympathetic challenge (cold stress test) showed sympathetic nerve dysfunction consistent with an early left carpal tunnel syndrome. 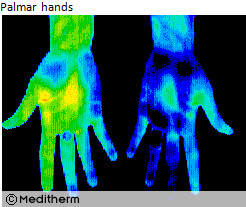 Thermographic sensitivity for detection of early carpal tunnel syndrome is improved by cold stressing both hands. Sympathetic nerve fibers in the symptomatic median nerve are hyperirritable producing a sustained response during cold stress.